Bowling For Soup are heading all over the UK this week, with UK reunited rockers A in tow, spreading some of their pop punk cheer along the way. We sat down with drummer Gary Wiseman to find out all about their new tour, time off and the state of the economy. How's the tour going so far? "So far it's good but it's definitely a weird time to be touring. In the States and over here economies aren't exactly booming so some of the shows are a little bit slower with tickets, but that being said numbers are still good, the shows are good and the kids are happy to see us over here so we're having a good time." Are you having to put greater emphasis on touring because of the state of the industry? "That's been our thing the whole time. We've never really seen any record sale money so we're always touring and selling T-shirts to live. We're not necessarily having to tour more, we're just doing our thing, But you can see it. Certain cities that will always sell out are like 70% sold out instead. You can see people are hurtin' out there, but I think they enjoy coming out for some relief." You've got A on the bill with you on this tour. Are package tours like this likely to become more common? "We'll see. It definitely makes sense to get bands touring together with other bands that they might not normally do. If a kid's got $20 to go see a show he's going to go see a show he wants to see with two different bands on the bill instead of just one." 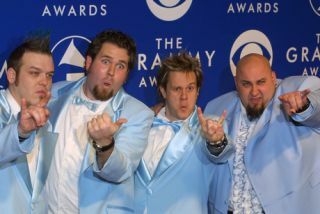 For the full list of Bowling For Soup tour dates head here.